PDF (Portable Document Format) documents can range from a simple single-page file to more complex documents such as brochures, data sheets, white papers and technical manuals, some containing thousands of pages, making them very difficult to handle. Accessing the information you need to read, print, publish and share can become a challenge and very time-consuming. Having a PDF utility to ease and streamline your workflow is essential. PDF Splitter & Merger is a PDF tool developed for quicker and more efficient access to information needed from your PDF files, reorganizing them in a way that makes them easier to manage and handle. With the ability to split PDF files into separate documents, either by page range or page numbers, and merge an unlimited number of PDF documents into a single PDF file, our solution helps you gain control of all your PDF files. PDF Splitter Merger is highly efficient and advanced software to split and merge numerous PDF documents in very nominal time and efforts. Splitter and Merger offer competent solution to appositely combine and divide multiple PDF files in one or more PDF documents. PDF Splitter and Merger Application acquires user friendly instinctive graphical interface and facilitate division of multi-page PDF document to single page document or one common PDF file and joining of several distinct PDF documents in one common PDF. Splitter and Merger is extremely versatile approach to flawlessly combine and split number of varied PDF documents including text, graphics, images, colors and other formatted data excluding minute alteration or deformation in primary PDF documents. PDF Splitter and Merger offers vastly competent tool along with functionality to opt specific page range for combining and division of multitudinous professional PDF documents. Splitter and Merger provide an automated effortless standalone program to split and merge multiple PDF files without involving third party software such as Acrobat Reader. PDF Splitter and Merger is easy to use, inexpensive application and compatible with all Windows Operating System. Application offers proficient solution to precisely split batch of PDF documents in few steps with use of very less time. PDF Splitter divides various PDF document to create individual or another segregated PDF document. Splitter easily split multi page PDF files to generate single page PDF or one PDF. PDF Merger part merge several PDF documents including single or multiple pages to append existing PDF documents or create new PDF files with specific pages. Application offers excellent functionality to merge numerous professional PDF documents with text, graphics etc and maintains primary PDF files identical. Split a PDF file into single pages or sets of pages. Automates the process of splitting. Split PDF documents by page numbers or custom page ranges. Merging one or more PDF files. 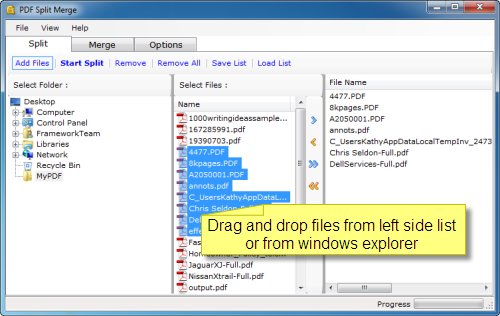 Automates the process of merging multiple PDF files. 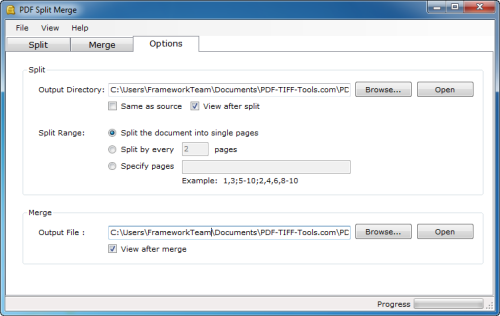 Merge, combine, join, append, concatenate PDF documents. Rearrange pages in a PDF document. Drag and Drop support of files. PDF Splitter is a very simple, lightning-quick desktop utility program that lets you split any Acrobat PDF file into smaller PDF files. It provides complete flexibility and user control in terms of how files are split. PDF Splitter provides numerous alternatives for how your large files are split - by pages, by page range. Even you can extract or remove part of a PDF file. PDF Splitter represents the ultimate in file splitting flexibility to suit every need. PDF Splitter does NOT require Adobe Acrobat, and produces documents compatible with Adobe Acrobat Reader Version 5 and above. PDF Combiner is a simple, lightning-fast desktop utility program that lets you combine two or more image files or Acrobat PDF files into a single PDF document. It is easy-to-use and has transparent interface. All you have to do is to setup it and make several clicks. PDF Combiner will provide you with the fast and error free combining of PDF files. Download PDF Splitter and install it on your computer. A free trial of the program is available for download. Run the application. Click on “Add Files” to add PDF files to the list. 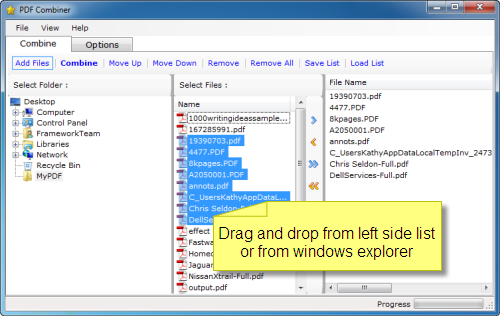 You can drag and drop files and folders from the Add Files section or from the Windows Explorer. After selecting PDF Files for splitting you can directly click on START SPLIT button to start splitting. Before that you can change the Options like split range (split the document into single pages, split by every x pages, and specify the pages). Now to split the PDF, click on START SPLIT button to begin the batch splitting process. All of the generated PDF will appear in a separate output folder. Download PDF Combiner and install it on your computer. A free trial of the program is available for download. Run the application. Click on “Add Files” to add PDF files to the list. 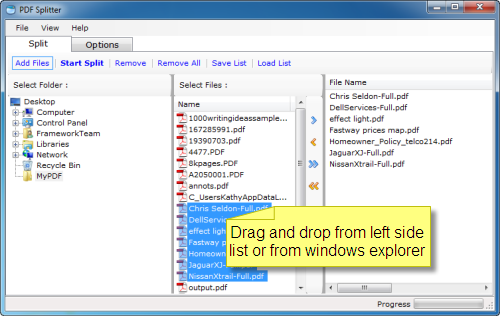 You can drag and drop files and folders from the Add Files section or from the Windows Explorer. Now to combine the PDF, click on START MERGE button to begin the merging process. Generated PDF will appear as specified output file.